Hmm, not sure. It could be your installation or possibly even the locale you're using. I remember trying to run the unicode-converted files (which the current release is based on) on a Korean locale and it wouldn't run. Maybe you could try copying the files to your computer as you have done, and then try running the installer to do an installation upgrade/repair by pointing it to the game folder. If it's the same version, it'll probably go into reinstall mode, not upgrade. The reasoning behind that is that if the install needs to be fixed, the only way to be sure it's fixed is to reinstall the whole thing. I may change this behavior in the future, but for now if you want to force upgrade mode, edit the VersionNum string in HKLM\Software\mirror moon\Fate/stay night English to a lower value (say, 1.0) and then rerun the installer. But I'm more expecting it to be locale-related. Did you run the game successfully in this particular locale before? In this specific one I'm not sure, but the game did work on an English locale, so I assumed it worked. Since the locale pictured is not Japanese nor English, I assume that is the cause. Hmm, I'm not sure if this'll work, but maybe you could try using AppLocale or SBAppLocale to run the game via the English locale. I'll try Applocale. The computer is not even mine and it's ways away from where I am, and the person showed a fleeting interest in FSN, so if Applocale doesn't work then I'll give up. Suddenly voice not found errors instead of any voices. I caught the third one -- the very last page's very last savegame here. These continue for QUITE a while, and the game regains voice when the magus dagger is passed to Shirou. "That is why you destroyed your own country" much later lacks voicing as well; a couple lines before "About eight meters" as well, then a couple lines before "My brain explodes" a bit later, then before "So I have to stand up", then the "AAHHHHHHH"(ry, then the "Higi"(ry, then the "Kotomine Kirei" shout, then the "Shut up! I never had any plans"; a bit later, the Saber's "Kuh", then the "!" before "Her armor screams out", then the "EXCALIBUR" shout, Shirou's "Ag" and the next few utterances a bit later. (At this point, "cannot be infringed by anything not even by" lost comma.) A bit later, Saber's "EX" and "CALIBUR" yells are missing; a bit later, Shirou's "Kotomine Kirei" shout, as well as the following Shirou's and Saber's lines for too good a while. The route ends in silence. Patched voiced v3.2 CD version on a W7x64, Japanese locale. Also, all those "anyways"es aren't even good English. Last edited by Kaens on May 27th, 2012, 7:50 am, edited 1 time in total. Thanks for the report, Kaens. It's a bit of a puzzle but we'll look into them for a next version. The scene at the end with Shirou and Lancer has garbled text for Lancer's dialog. Shirou speaks normally, and there is text for his voice. But when Lancer speaks, the text was garbled or something. For every single line of his dialog. But all of Shirou's text was fine. I'm incapable of getting past the temporary files part of the installation. I've gotten to inserting the second disk once, but then it froze up on "extracting temporary files" on that disk as well. This is a legit version of the game - new in fact - that I just bought in Akihabara today. Edit: it's worth noting the installation doesn't crash - it just infinitely "extracts temporary files". Edit x2: Was I supposed to install this before I installed the game itself? Was my understanding this was a patch. Solved: Restarted it, didn't work. Reinstalled the game then restarted and it worked. Forget this post even happened, lol. Perhaps there was a problem with the z-order that made you miss a popup asking to insert disc 3? To answer your question, the installer can both install a new game, and patch an existing game. If the installer asks for the CDs, then it didn't find/recognize the existing game. Make sure to point it at the proper directory, if you want to patch a Japanese install. I downloaded my version of F/SN off Fuwanovel and each time I go to open the .exe error messages in Japanese pop up along with two text boxes with a blue background with a lot of coding on them. 64-bit Operating system, x64-bassed processor. Also, when I start the installation the installer says that it doesn't recognize my OS, but allows me to continue. I can say to continue with the installation and finish it, but when I do I get an angry notification window, a window with an empty, blue screen and some small toolbar. 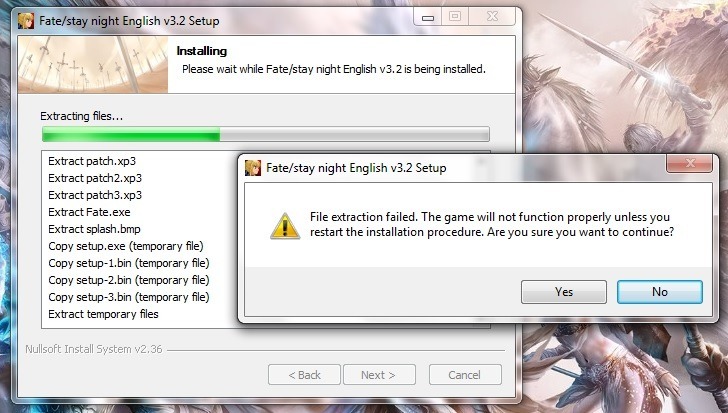 Evening, I'm currently trying to install Fate/Stay Night, however it isn't working for me. Pops up with the following error message "File copying failed please restart the installation"
Install the japanese version from the disk in order to patch that. -I've switched the system language to Japanese and I get the same error message. The first time I tried the installation I ran out of disk space due to the way I originally set up the virtualbox. I have created more space and I deleted the files that it had copied over, could that cause problems? Is it possibly something wrong with virtualbox handling the DVD, not letting the exes run correctly? Is the 10th anniversary version different to the normal dvd version? Can anyone provide some advice on what is most likely to be wrong and what I should try next? Hey, I have a small problem. I have Windows eight , and when I try to use the translation patch, it tell me it is no built for this operating system and make have problems. Then, in he extraction process, it says that file extraction failed and it stops there. Naturally, the game doesn't work. I also have this problem. I cant advance the story. I don't know what the problem is, but if you upload your saves I'll see if I can reproduce it and try to fix it. I left out one important piece of information. This is my second time reading the VN. I still had the previous mirrormoon translation version. I was using v3.1. You can also see the quote I used was back in 08. I did a clean re-installation with v3.2 and now it's fine so no worries. I lost all my descriptions of my save files though. There's some continuity errors, premises and logic fail, sentence structure fail, wording and grammar errors, Audio vs Test, that I made note of. keptyouwaitinghuh wrote: I left out one important piece of information. This is my second time reading the VN. I still had the previous mirrormoon translation version. I was using v3.1. You can also see the quote I used was back in 08. I did a clean re-installation with v3.2 and now it's fine so no worries. Yeah, sometimes the saves might not be compatible if you made a save in the middle of a scene. It's probably best to try loading a save right before a scene ends or at the very beginning of the next one. This problem is usually caused by script changes or edits done in later patches. If that doesn't work, you might be able to find someone else's saves somewhere or use the control key to skip the text until you get back to where you were. I found a post a explains the cause was because either the translation or the voice patch from FSN RN contains something that is not present in FSN PC. The game tries to find something that is missing, either a line of text or a voice dialogue or music or sound effect or something that's from FSN RN but not present in FSN PC, so it just stop. When you save, you can make note of descriptions. I simply just lost all my descriptions on certain scenes. Because I have found some continuity errors in the UBW route, for example. I planned to post what I found on a forum; animesuki, and just share and discuss what I found and what I think.